05 Dec STATFlash: Managed SD-WAN Services Market Tops $282 Million in the U.S.
BOSTON, MA, DECEMBER 6, 2018 – Vertical Systems Group has initiated coverage of the carrier-based Managed SD-WAN Services market with a focus on service migration, network connectivity and market sizing. Research content available now includes Managed SD-WAN purchase drivers, customers, WAN access connections, site configuration profiles, pricing and revenue. 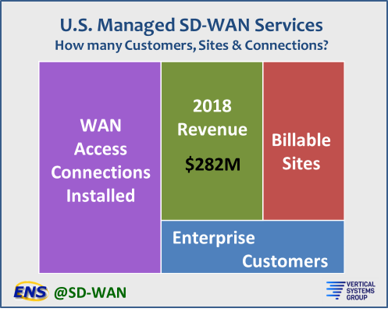 U.S. revenue is estimated at more than $282 million for Managed SD-WAN services in 2018. This figure is based on billable U.S. customer sites and WAN access connections installed and under management. A Managed SD-WAN Service is defined as a carrier-grade network offering for enterprise and business customers, which is managed by a network operator, and delivered over a Software Defined Network (SDN) service architecture that has separate control (overlay) and data (underlay) planes. Not included in this analysis are DIY (Do It Yourself) SD-WAN solutions purchased directly from an SD-WAN technology supplier or a systems integrator. Providers actively selling Managed SD-WAN services in the U.S. include the following companies (in alphabetical order): Aryaka, AT&T, CenturyLink, Cogent, Comcast, Fusion Connect, GTT, Hughes, Masergy, MetTel, Sprint, Verizon, Windstream and Zayo. Other network operators throughout the world offer or plan to offer Managed SD-WAN Services in the U.S. market. Vertical Systems Group will release the first Managed SD-WAN Services LEADERBOARD early in 2019. This new LEADERBOARD benchmark will rank the top providers of Managed SD-WAN Services based on U.S. market share results for year-end 2018. Research sources for share calculations include Vertical’s base of enterprise installations, direct input from our bi-annual worldwide surveys of network operators and other data sources. @SD-WAN is available now exclusively by subscription to an ENS Research Program. Initial Managed SD-WAN Services research quantifies the U.S. market, including market revenue, billable sites, customer counts and WAN access connections. Content also includes pricing by type (i.e., Broadband, DIA, MPLS, LTE, Satellite, etc.) site configuration analysis (i.e., BB+BB, BB+MPLS, etc. ), migration drivers to SD-WAN, a Managed VPN Segment Comparison, Directories of Managed SD-WAN Services network operators and Technology suppliers, Vertical’s Managed SD-WAN Services Definition, and more. Service migration analysis includes impact on MPLS and Site-to-Site Dedicated IP VPN installations. Contact us for ENS (Emerging Networks Service) Research Program subscription information and pricing.